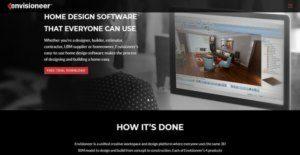 Envisioneer is an easy-to-use, multi-purpose, and unified suite of 3D BIM or building information modeling and home design software solutions that cater to needs of various professionals and users in the home design industry – designers, remodelers, builders, estimators, contractors, and homeowners. This creative workspace and design platform is crafted by Cadsoft, an award-winning creator and licensor of BIM software products that have a large customer base. With Envisioneer, users can conceptualize home building designs creatively, visualize their design ideas realistically, build homes faster, and perform their project workflows and tasks with ease. The platform leverages the virtual reality capabilities of other systems to give users and their clients with a stunning and immersive 3D experience. Envisioneer has the capability to generate construction documentation to ensure that designs and plans are accurate and projects are completed on time. The platform comes with estimating and take off features that help building professionals immediately produce estimates and measurements from their models. Last but not least, Envisioneer provides a construction solution that offers a frictionless integration with existing business systems, eliminating data duplication. Visualization is among the reliable and innovative features of Envisioneer. The platform directly integrates with virtual reality technologies which include Oculus Rift and HTC Vive. As a result, designers, builders, and homeowners will be able to view what the designs will look like once constructed in a 3D environment that provides them with an immersive and stunning experience. So how does this virtual reality capability work? Users simply need to design and build their models within the platform. Once they’re done constructing their models, they can then have their clients put on the virtual reality helmet or headset from Oculus Rift or HTC Vive. After the virtual reality mode is activated, clients will be able to visualize a virtual reality showroom. As users apply changes to their designs and make sure that they meet the expectations and requirements laid out by their clients, the virtual reality showroom is also updated accordingly. This way, homeowners can pinpoint any issues in the designs and suggest improvements, and at the same time, actively involve themselves in the purchasing process early. Envisioneer also comes with powerful building wizards that guide users as they explore different interior design and decorating concepts. Ideal for homeowners and hobbyists, these wizards are available in Envisioneer’s 3D software which is built for personal use. Known as Personal Architect, this solution streamlines the designing and creation of new spaces such as kitchen, bathroom, and deck. Design professionals need to precisely deliver the design concepts that their clients are expecting. This means that everything should be accurate, and this is very important for users and clients that are working on projects with a limited budget. However, the desire to attain accuracy should not compromise productivity. Thus, Envisioneer ensures that design professionals are able to produce construction documents accurately and quickly. With Envisioneer, design professionals can immediately extract drawing information and details from the models they created which include elevations, sections, and more. In addition, the platform has a built-in library of drawing and design details which they can customize. If they want to create their own library of details or upload libraries from multiple sources, Envisioneer also allows them to do that. Because of this, their designs can be reviewed and approved by homeowners and other stakeholders much faster. Estimating is another innovative feature available in Envisioneer. With this feature, builders and remodelers can come up with complete material lists from their models. Alongside with these material lists, they can also quickly generate cut lists, pricing details, and measurements. Additionally, the platform delivers a 3D takeoff feature which enables them to spot estimation mistakes as early as possible. This way, their projects will be free from costly construction errors, helping them establish stronger client relationships. Envisioneer can also automatically generate walls, floors, and roof framing based on purchased lengths as users create models within the platform. Because of this, they will be able to check whether the framing methods they are applying on-site are consistent with their models. If there are conflicts, they can easily identify them, preventing waste of time, material, and money. To wrap it up, the 3D building information modeling solution can seamlessly work with third-party business applications such as POS systems and accounting tools. For example, information related to material shipments are instantly imported into an existing POS system, eliminating the need for entering data twice. If you are interested in Envisioneer it could also be beneficial to investigate other subcategories of Best Architecture Software gathered in our base of B2B software reviews. There are popular and widely used solutions in each software group. But are they essentially the best fit for your company’s unique needs? A trendy software solution may have thousands of users, but does it present what you require? For this reason, do not blindly invest in popular systems. Read at least a few Envisioneer reviews and think about the elements that you wish to have in the software such as the fees, main functionality, available integrations etc. Then, choose a few solutions that fit your requirements. Check out the free trials of these platforms, read online reviews, get explanations from the maker, and do your investigation thoroughly. This profound homework is sure to aid you select the finest software platform for your firm’s unique requirements. How Much Does Envisioneer Cost? Envisioneer offers four SMB and enterprise pricing plans for all users to choose from. The pricing of the plans varies depending on the software product and version you’ll purchase and the features and capabilities you need. We realize that when you make a decision to buy Architecture Software it’s important not only to see how experts evaluate it in their reviews, but also to find out if the real people and companies that buy it are actually satisfied with the product. That’s why we’ve created our behavior-based Customer Satisfaction Algorithm™ that gathers customer reviews, comments and Envisioneer reviews across a wide range of social media sites. The data is then presented in an easy to digest form showing how many people had positive and negative experience with Envisioneer. With that information at hand you should be equipped to make an informed buying decision that you won’t regret. What are Envisioneer pricing details? What integrations are available for Envisioneer? If you need more information about Envisioneer or you simply have a question let us know what you need and we’ll forward your request directly to the vendor.